The biggest challenge RVers usually face is making a decision between Motorhome vs Travel Trailers. They both serve the same purpose, i.e. to accommodate voyagers. However, there are few things about them that make a real difference. The most significant one is the way by which your movable home is attached to the vehicle. We will highlight a few facts related to both motorhome and travel trailer. It will then help you in choosing the right option for yourself. Before moving towards different factors related to motorhome and travel trailer, we will first define them briefly. 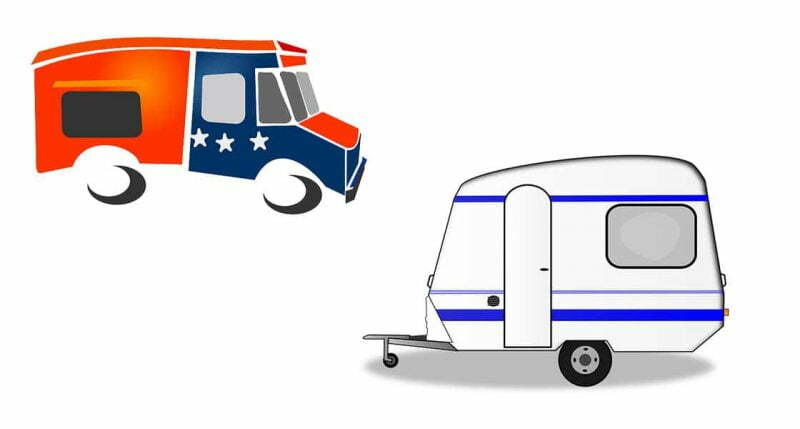 What can you expect from travel trailer vs motorhome? How motorhome and travel trailer compete/encounter each other? Who are the winner and worth your purchase? The motorhome is recreational vehicles that move on its own. It contains an integrated engine that is able to shift this vehicle on its own. It offers a kind of luxurious facilities. However, with the ease, they ask for the hefty amount as well. They provide full-fledged mobile accommodation. It may include living rooms, bedrooms, kitchen, bathrooms, and other storage. However, these conveniences also depend on the class of motorhome that are A, B, and C.
Another worth mentioning feature is their versatility. These vehicles are can be personalized. You can adjust them according to your traveling requirements. The people who prefer motorhomes are usually those who adopt RVing as their around the clock task. Moreover, few retirees and telecommuters can also be seen residing in them. Those people, who abandon their homes permanently for traveling purpose, also prefer these advanced RVs. On the comparison of Motorhome, we have travel trailers. You can consider them as living compartments that you need to drag by another vehicle. These trailers are hitched to your trucks. However, you can use mini trucks, SUVs, and other small vans to pull them. You can take them anywhere by driving your big vehicle to that place. Once you reach your destination, you can set your trailer up on site location leaving your vehicle free behind. There are no fixed size or facilities available in these RVs. It all depends on your trailers. They can either be small or large with the length up to 33 feet. For both these vehicles, we must say, it is obviously difficult to pull them. Many people think of the same pattern. However, there are some differences too. The motorhome is all in one package. Whatever you do with your vehicle, its effect spreads evenly all across the RV. It makes driving a bit easier. Different campers get used to them soon and find it seriously comfortable as compared to trailers. Now, on the other hand, driving a big vehicle with an even bigger trailer behind is something actually complicated. It is mainly because the trailer won’t react to every action you take on your vehicle. It can create problems especially while taking turns, applying sudden breaks, or lane switching. Therefore, RVers usually need to take learning classes before they actually jump on the road. Few take them, and others simply quit RVing or switch to the motorhome. By financial load, it doesn’t mean the purchasing cost only. You would need to consider other expenses too. It is because; they are not trivial in the case of RVs. If we only consider buying cost as total monetary involved, then a motorhome is for sure more expensive option. Even, if you buy a class C vehicle, you would need to invest a lot of money. Class A motorhome may cost as much as buying a permanent home. The travel trailers, on the other hand, are relatively cheaper. But, it is the case when you already possess the towing vehicle. Otherwise, the total cost of the trailer with a big vehicle would cost you somewhere near a motorhome. In short, you should spare a good amount of budget for purchasing these RVs. It is quite common for complex things to ask for cream of the crop maintenance. The same situation you would face with a motorhome. It is overall a complex vehicle with all built-in accommodation facilities. It possesses complicated engines, transmissions, filters, pumps, and other circuitry. All these things need special care. Once, anything goes out or order, you should prepare yourself for adequate treatment. Regrettably, the whole cost spent would mend your budget too along with the vehicle. On the other side, we have comparatively simple trailers. They don’t possess critical systems, and they don’t ask elite treatments. Moreover, you won’t have to leave your ‘whole home’ at a mechanic shop. You can set up your trailer anywhere, and let the mechanic do repairing with vehicle only. Considering theses upholding conditions, we can say, trailers dominate the competition. Driving a recreational vehicle is just like pulling your home with you. It takes power expenditure. Therefore, the overall fuel consumption for RVs is high. In a motorhome, the amount of fuel depends on its type and gears. But normally, you can expect fuel utilization somewhere between 6 to 8 gallons per mile. On the other side, if you are towing a bigger trailer, fuel consumption will be more. Here, you can expect 8 to 12 gallons of fuel per mile. On the whole, we haven’t noticed any significant difference between the fuel consumption of both RVs. The depreciation value of these vehicles is their major detriment. It might keep many people away from buying them. These are basically vehicles. Therefore, you can’t expect their sale price to be higher or equal to their original worth. Their value decreases as long as you possess them or drive them. However, the case with a motorhome is even severe. Their resale value decreases with the number of miles you cover on them. The motorhomes pull your home right with them. Everything is connected. You can easily perform your required activity without stopping your vehicle. It is greatly beneficial for the crowdy area as well as during harsh weather conditions. You keep seated inside the vehicle, and can eat, sleep, and go to the bathroom. However, you won’t get this convenience with travel trailers. You can assume them as pulling your home right behind them instead of towing with them. You would have to stop every time you have any necessity. As in motorhome, you have everything under one unit, staying at any site would not ask for more effort. All you would need is to find a plain ground and fix your vehicle there. Besides, you would only need to attach crucial supplies if you have them. On the contrary, with a travel trailer, you would need to fix your trailer and chain it. It might involve more effort. However, here worth noticing point is trailer spare your vehicle if you want to roam around while motorhome doesn’t. We will say both motorhome and travel trailers are a winner but in different circumstances. We have discussed all major points that can help you in identifying the comfort and difficulties associated with them. How often you will use your RV? We can see many people who go out RV-ing for once in a blue moon. For them, it will not be a wise decision to spend a hefty amount on these vehicles. Otherwise, it would be really hard to see these expensive items doing nothing and standing at your garage for no good. On the other hand, full-time RVers, and those who go out on long trips after every few weeks can consider purchasing a motorhome. It is because they will spend most of their times on it. Therefore, it must be comfortable for them. How many people will accompany you? Are you a couple or a group of people? The number of people who will travel with you can also alter your choice. For a couple, as a small and inexpensive option is suitable. Do you possess a towing vehicle? A travel trailer can be an affordable option in the case when you already have a mini truck, SUV, or other vehicles for pulling trailers. If you don’t possess any of them, it will cost you a big amount of purchasing a trailer and a big van. What is your expertise level? Are you a beginner or an expert RV-er? How is your driving? These questions also need your consideration. It will make no sense for a newbie with zero RV driving experience to purchase Class A motorhome. It will end up in some big loss or accident. For the first timers, it is appropriate to go for some mini trailer options. Once you get used to it, you can switch to more expensive and luxurious vehicles. How much can you spend on Rv-ing? It is the most dominant condition. How much money you can contribute to your adventures? If you don’t have enough money, you would have to give up on a motorhome or buying small trailers. However, you can also consider purchasing some used vehicles. Recreational Vehicles are convenient and enjoyable options for adventure lovers. They can make camping more joyful by providing all facilities. However, which option you should go for Motorhome or travel trailer, it typically depends on personal choices and your capabilities. For round-the-clock RVers with strong bank balance, the motorhome is the best option. For others, the travel trailer is also a great alternative. With a bit of effort, you can still enjoy your vacation to its fullest.